A histogram is a display of statistical information that uses rectangles to show the frequency of data items in successive numerical intervals of equal size. In the most common form of histogram, the independent variable is plotted along the horizontal axis and the dependent variable is plotted along the vertical axis. The data appears as colored or shaded rectangles of variable area. Anyway we recommend you to use our tools for creation histogram charts. flowchart, and scatter diagram. A generalization of the histogram is kernel smoothing techniques. This will construct a very smooth Probability density function from the supplied data. Use FREE our tool for SORTED data or our tool for UNSORTED data to create your histogram chart! A frequency distribution shows how often each different value in a set of data occurs. 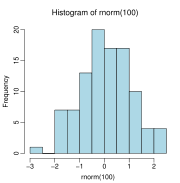 A histogram is the most commonly used graph to show frequency distributions. It looks very much like a bar chart, but there are important differences between them. * When the data are numerical. * When you want to see the shape of the data�s distribution, especially when determining whether the output of a process is distributed approximately normally. * When analyzing whether a process can meet the customer�s requirements. * When analyzing what the output from a supplier�s process looks like. * When seeing whether a process change has occurred from one time period to another. * When determining whether the outputs of two or more processes are different. * When you wish to communicate the distribution of data quickly and easily to others.